I found this gas pump on EBay last night. It is a Martin & Schwartz model 80, restored to Standard Oil of Indiana logo. However, it has ad glass with "Royal". As a Conoco person, I recognized the Royal ad glass as a Conoco brand but I wasn't familiar with it for Standard. I searched the internet and found another brand - Red Hat Gasoline - that used the Royal ad glass; however their "Royal" is in larger letters and in a different color. My understanding is that Standard of Indiana used a different version of the M&S 80 pump when it was introduced in 1946. Conoco, Sunoco and Mobil used the M&S 80 model with script tops (and later ad glass), while Standard used a model without script tops - one with the sight glass at the top of the pump. My conclusion is that the pump on EBay is a restoration that is inconsistent with the history of this pump (obviously, a collector can restore a pump any way he wishes). A Standard M&S 80 pump would not have the ad glass feature. Can anybody add any other perspective to this? Last edited by ConocoRetiree; Sat Aug 18 2018 08:34 AM. To my knowledge, whenever you see a glass top with a globe, the globe was been added by the restorer. It's probably an original ad glass top, you can buy repro fiberglass tops but they take a lot of work to fit right. That top seems to fit really nice, probably an original top. I added a globe to a repro fiberglass glass top once, it helps sell it, especially a few years back. I wouldnt cut up an original glass top though, too valuable and cool as is. I'm sure they were thinking royality goes with a crown right? Let's put those together. I purchased a M&S 80 and restored it some years ago. The script top was painted over. After paint removal I had the exact ROYAL script top as in the photo. After researching it I discovered that it was indeed a Conoco. Here are a couple of pics from Henderson and Benjamin’s book. Note the text...the Royal adglass would go with the Royal triangle gas pump plate. Stephen: thanks for the post. I also have the Henderson/Benjamin book and I agree with your comment about how an authentic Conoco Royal M&S 80 would look. Here is a photo that I found somewhere on the internet, that shows the proper Royal signage. It is a bit worn looking, but authentic nonetheless. Here are a couple of pics of the MS80 that I restored. As you can see, the ad glass was painted over. I also found the Red Hat Royal 400 pic on line and copied it’s design (this decal that I used was the only Red Hat I could find) before I realized it should have been badged a Conoco Royal. 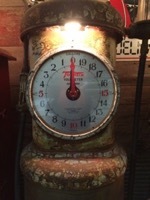 Stephen: two things about your unrestored pump make me wonder if it was originally a Conoco Royal pump. First, the decal on the pump body appears to be square, and at no time (in that era) did Conoco have a square decal on the pump skirt. 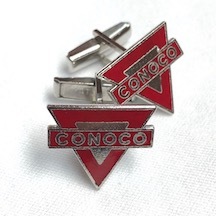 They used the Conoco triangle and much later in the mid-1960's you might also find a pump with a narrow rectangular decal (either diagonally or horizontally placed). For a short while with the introduction of the "Super" brand in 1953 (before the Royal brand was introduced), they added a round "TCP" decal. Could you make out letters or anything from that square patch on your pump? Second, the ad glass appears to protrude out of the top of the pump. I cannot find any examples of Conoco Ad Glass where the glass protrudes outside the body, as in your example. I do find that in the Red Hat Royal pump, but not in any Conoco Royal pump. Could it be that Red Hat used a different design for their Ad Glass? I am attaching a few examples of Conoco Royal pumps, where you can clearly see the Ad Glass is recessed into the top section of the pump. The later Wayne/M&S 80 pumps used a plastic ad glass that protruded out from the top of the pump. Those top are fiberglass as well and not steel. Steel tops used glass ad glass. Those fiberglass tops also have a protruded out vent on the sides that you see with the plastic ad glass. The steel tops had vents on the side but they did not protrude out the side as they are more in line with the main body of the pump. That Royal plastic ad glass is Conoco. Look at the pumps pictured above and see the differences in the fiberglass and steel tops. Very easy to see the differences. Keith: thanks for the education on the difference between the steel and the fiberglass tops, as well as the glass vs. plastic inserts. Your description of the difference is helpful and clear. However, I am still struggling to see that the plastic Royal ad glass is Conoco. All of the Conoco gas station photos, Ads, and well-restored pumps that I have seen show the Conoco Royal ad glass as red background with white lettering (as shown in two of the Conoco pumps in this thread). I have seen two Red Hat Royal gas pumps - both shown in this thread. Both of the Red Hat pumps have Royal Ad Glass that is white background with red lettering. Regardless of whether the gas pump has a steel or fiberglass top, it appears that the color of the ad glass is a distinguishing factor between Red Hat and Conoco. Do you see it the same way? Or have you seen Conoco "Royal" ad glass with the white background? Keith: I did some digging this afternoon, and I now agree with your comment that the Royal ad glass shown (white with red letters) is very likely a Conoco ad glass. In the PCM Guide to Gas Pump Restoration, the attached listing of Ad Glass does indeed show two versions for Conoco Royal - one in red with white letters and another in white with red letters. I suspect the later version (white with red letters) was used for the later Wayne 80 pump, the one with the fiberglass top and plastic insert. I have found a few other Conoco pumps with plastic inserts, but they are the “Conoco” brand rather than “Royal”. I have not seen a photo of a Conoco pump in the later Wayne 80 with the fiberglass top and the “Royal” plastic insert. The reason is probably that the Royal brand was only used from around 1957 through 1960. Thus, we would only see this Royal insert for a short window of time and - more importantly - only on brand new Wayne 80 pumps. All of Conoco’s existing M&S 80 pumps would have been retrofitted with (red) ad glass inserts when the Royal brand was introduced. Conoco probably had very few of the later Wayne 80’s in service when the Royal brand was replaced by “Premium” in the 1960/61 time frame. The attached pumps with the fiberglass tops and plastic inserts are easier to find because Conoco used the “Conoco” and “Regular” brands for many more years than they did the “Royal” brand. 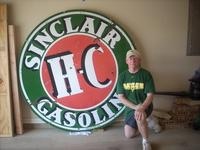 Royal was a brand used for 3 years, while Conoco/Regular was used from 1955 into the 1970’s. I also did a little digging into the Red Hat brand. I searched on this forum and found a poster “Jack R” who indicates that Red Hat was part of the Independent Oil Men’s Association from 1926 to 1933. I also found another thread in which “2 Gallon Luke” and “Carolinatraveler” both indicate that a few Red Hat stations existed into the 1950’s. Nonetheless, photos of Red Hat gas stations are exceedingly hard to find, and I only found one or two - and they were clearly from the late 20’s or early 30’s. It may be that the remaining Red Hat stations - if any - in the late 1950’s did not have the later Wayne 80 pumps. There might not have ever existed a late Wayne 80 pump in the Red Hat Royal 400 logo. I wonder if the Wayne 80 “Royal Red Hat 400” pump in this thread is due simply to an enthsuiast who wanted the Red Hat Royal 400 logo on their Wayne 80 pump, and the found the closest (or only) Plastic Ad insert that fit the Royal name and the Red Hat colors? To add some more mystery to this issue, attached is a restored Wayne 80 with Union 76 colors on the pump and a (Conoco?) Royal ad glass insert. I checked and Union 76 did indeed sell a “Royal 76” brand of gasoline, starting around 1955. However, I suspect this particular “Royal” ad glass - due to its red color - is a Conoco ad glass. It is identical to the other Conoco Royal ad glass, and the color doesn’t match the Union 76 orange colors. The square, where there “had” been a pump plate, was a Mobil. The other side of this MS80 had the Mobil Pump plate when I bought it in Sulphur Springs, Texas. The service station where my pump was used must have changed brands. In doing so the fiberglass top along with the ad glass had been painted over as you can see in the first pic and rebranded Mobil. I just noticed...the Mobil pump plate in my “after” restoration pic on the floor beside the MS80 Pump is indeed the pump plate that was mounted when I bought it. Stephen: I am frankly a little surprised that Mobil did not properly retrofit your M&S/Wayne 80 with a new "Mobil" plastic Ad insert. After all, Mobil was a partial owner of M&S (before the acquisition by Wayne in 1951) and used the M&S 80 extensively. So I would think availability of the replacement plastic insert wouldn't be a problem. My best guess is that the Wayne 80 with the fiberglass top and plastic Ad insert was not widely used. In the retail business, when a company "de-brands" a service station they insist that all prior company signs and logos be removed. Painting over an Ad glass and a pump skirt sign would be consistent with what I would expect from an off-brand discount jobber that was required to remove the Mobil or Conoco logo. Anyway, we will probably never know the real reason. Where did you get the "Royal" plastic ad insert? Did you simply clean up the existing insert? Or did you have a brand new replacement insert custom-made?